There are two types of HRC Swingarms made for the fireblade. The first is designed for WSB and endurance and has gucci quick release rear wheel nuts and this version. This version is the 2011 and is much stiffer than stock. This can be seen in the photo with the weld seem and additional bracing. The other advantage is that the swingarm is longer than standard, This makes the wheelbase longer and improve the handling (not that it needs it!). The cosmetic improvement is the lifter fittings at the end of the swingarm to ease lifting. 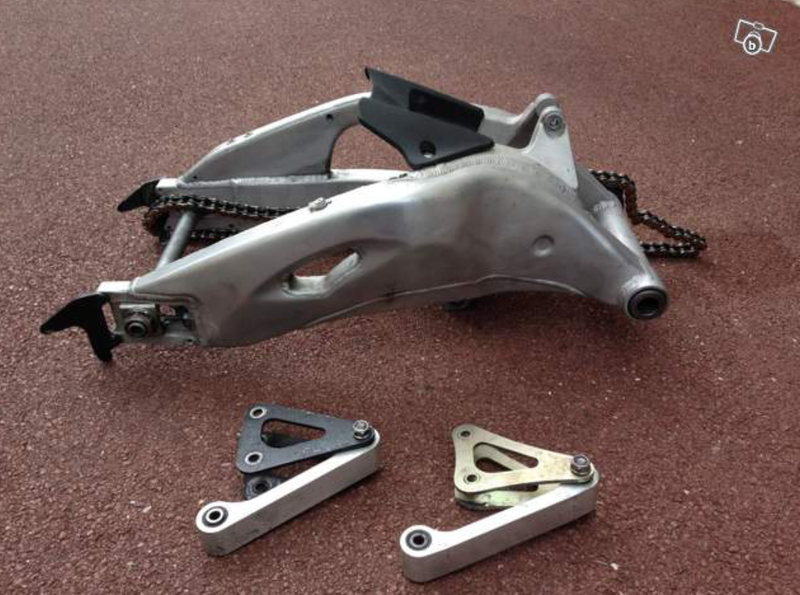 For me this swingarm will complement the bike perfectly. Every other HRC Swingarm has been black in colour but was not in keeping with the Repsol CBR1000RR theme. The other advantage is that this still has the brackets for a stock brake or my new underslung brake. This means it can swap over with no real issues. The next obstacle for me will be setting the bike up with the Taylormade exhaust. The weld seem is where the carbon trim sits and hopefully the new swingarm will not foul the cover. It's currently a little grubby but am sure it will clean up nicely.